Fascinated by the question of 'What is ART?' and mesmerised by the hive mind of the internet, artist Robert Good began to collect online definitions as a way to explore both these ideas in one project. Eventually it became clear that a dictionary format, with full editing and annotation, was conceptually the best way to articulate the question as directly as possible, by way of a humorous, lively and inspiring process and in so doing, indirectly provide an answer. 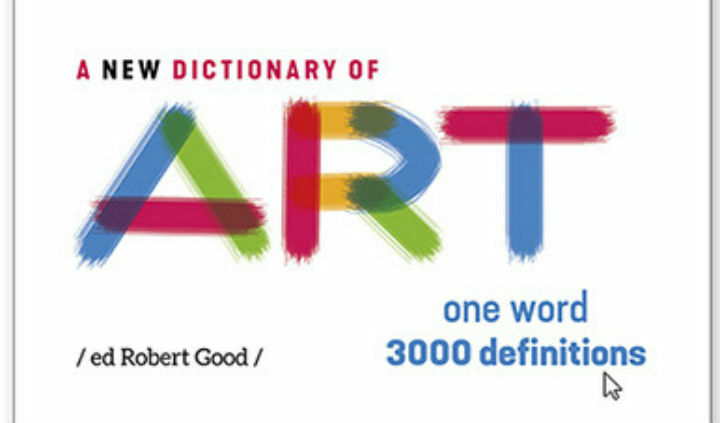 Good's new Dictionary follows in a great tradition of helpful reference books for the tidy minded but it takes a refreshingly alternative approach to the question 'What is Art?' listing over 3,000 definitions compiled from the internet via chat-rooms and discussion forums as well as from the more established authorities, artists and institutions. Passions run high as formal sits alongside informal, humorous alongside vulgar: all are left to fight it out on the page. Join the esteemed panel to discuss What is Art? CORINNA LOTZ (chair) is an art historian and critic who has worked closely with artists over many years. Her articles and essays have appeared in Apollo, Galleries, Museums Journal and other publications. She writes from a revolutionary, dialectical point of view. JANE GLENNIE is an artist and typographer who works with installation and poetry film, while remaining fervent on the finer points of typesetting. Visit their website for more information. MATTHEW ROWE is a lecturer and tutor at City & Guilds of London Art School. Since gaining his, he has published articles and speaks at conferences on topics in the Philosophy of Art. His main focis of interests are in definition and ontology of artworks as well as the interplay between art theory and practice. Matthew is also an editorial panel member of the journal Evental Aesthetics and has his own occasioanl art practice. He has been studying and thinking about the definition of art for nigh on 15 years and had reached no definite conclusions. JUAN BOLIVAR lectures at Camberwell UAL. His work combines elements from disparate sources investigating hybridity, language and abstraction. Through this dialogistic tension, ‘abstraction’ acts as an intertextual springboard onto other sub-cultural positions highlighting the problematisation of this genre in post-conceptual painting. Bolivar often re-enacts modernist icons such as Malevich, Mondrian and Van Doesburg; using this context of interpretation to create a new narratives through the introduction of 'rogue' elements. Bolivar has curated over 40 exhibitions and is on the curatorial board of Turps Gallery. MARGUERITE HORNER did her BA in Fine Arts in her twenties and obtained her MA in 2004. Her paintings 'Lift the ordinary into the extraordinary and the specific into the Universal' (Lady Marina Vaizey OBE) To support her practice, Horner worked as scenic artist at the BBC where she trained for 3 years. All of her work during this time was commissioned and she painted in collaboration with photographers such as Adrian Flowers and David Bailey, painting backgrounds for publications such as 'The World of Interiors' and 'The Sunday Times'. as well as many award winning advertising campaigns throughout the 80's and 90's.